Edward Lee was born on June 5, 1895 in a little log house at the foot of a hill of white sandstone in the little village of Grouse Creek, Utah, Box Elder County, the son of Joseph and Mary Ann Mecham Lee. His family consisted of his parents and the following brothers and sisters: Joseph Valentine, Fearzmore Mecham, Mary Ellen, Isaac Franklin, William, Lorenzo, Hannah Bell, Lucius, Casper Earl, Lester and Alfred. He was reared and educated in Grouse Creek. The school was a mile and one half away from his home. He had to milk four cows before going to school and then in the evening after school he had to walk that one and a half miles again and milk the cows and chop enough wood to last his folks for the rest of the day. On the way to school sometimes as he would walk in the winter, with new blue denim overalls, the little knolls would be streaked with blue where he would climb up the hills then slide down. His favorite sports were baseball and basketball. As he grew a little older and able to drive an old Model T, he would get that old Model T and let it go down the ruts as he would deliver the mail. He didn’t have to drive it. He just followed the ruts. He would have his rifle with him and he would do his hunting along the way. He married Rhoda Annie Paskett on November 18, 1919 in Phoenix, Arizona. Ivan was born while they were in Arizona. One day Edward worked on a cotton farm and it was so hot down there he said they could walk right through a canal and come out the other side and not be one bit more wet than when the entered the canal. They moved back to Grouse Creek then over to Malta, Idaho. Cleon was born in Malta. 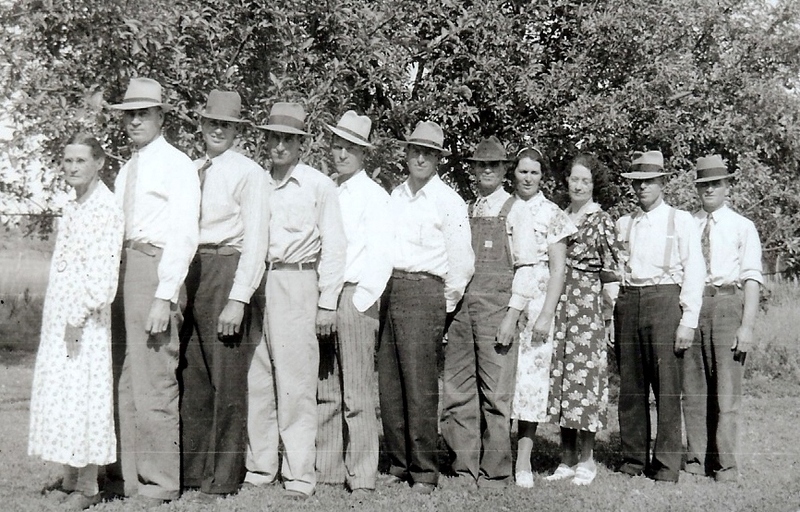 In the summer of 1922 they went to Black Pine Mountain to work at a sawmill for Edward’s brother, Joseph. It seems like regardless of what any of Edward’s children, would say he had already done it. You can’t outdo him. In the winter of 1922-23 they went back to Grouse Creek and then on to Montello, Nevada in April 1923 to work on the railroad. 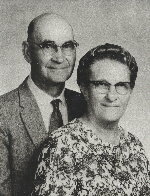 Edith and Rulon were born there. Mom was always used to a lot of music. There was no music in and around Montello so they ordered from Sears catalogue a little square cylinder type phonograph. We’ve spent many enjoyable hours with that phonograph. In 1927 they moved to Etna, just five miles north and a little west of Grouse Creek. Curtis was born in that seven-room log house on that homestead. 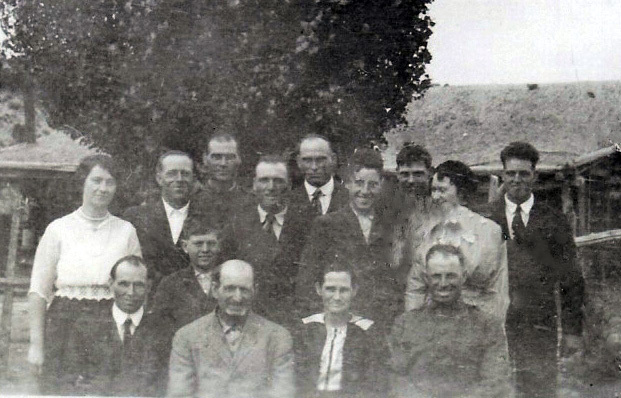 In 1928 the family moved to Oakley where Louise, Thurman, Jane, Wayne and Helen were born. They belonged to the LDS Church and they were sealed in the Salt Lake Temple in 1929. Edward worked for the Ford Garage and was an auto mechanic for more than fifty years, retiring in about 1965. In April 1937, the year the twins were born, Edward, who was working in the garage at that time, earned $16.00 for that one month. He has seen the time when he didn’t have a penny and very little food in the house. During World War II they sent four sons into the service. Louise was killed in an automobile accident in 1932 and from that time until 1975 there were no deaths in the family, starting with Rhoda and Edward and their posterity. Edward liked to go deer hunting. One time he and another group went. They got themselves all camped down ready for evening and went to bed. Then everything was quiet. All at once someone said, “It’s getting light in the East.” They got up, prepared breakfast, put their camp rolls away, etc. just in time to watch a full moon rise. There was a little bit of buck fever involved there. One time Edward pulled a practical joke. There was one particular individual in town who liked to chew tobacco and while he was driving his car the window was always down. One day Dad washed that window really sharp and shiny and left the window up. You can imagine what happened. Nothing could be put over on Edward. He was always conscious of what was going on. Edward played the accordion quite often. The family loved to hear him play and in the winter time the family would sit around the pot-bellied stove and listen to him. In 1942 the family moved into town in the old Harper home. In 1975 Cleon built the folks a new house. Edward passed away Friday, April 24, 1987, at the age of nine-one and is buried in the Oakley, Idaho cemetery.